Frost warnings, rain storms and 80s...oh my! This week, we will deliver to all Late Summer Vegetable, Fruit and Egg Share members. 2019 Shares coming soon - We will be opening up registration for the 2019 season soon -- stay tuned! As I'm sure you can relate, we continue to "go with the flow" of our strange weather patterns. 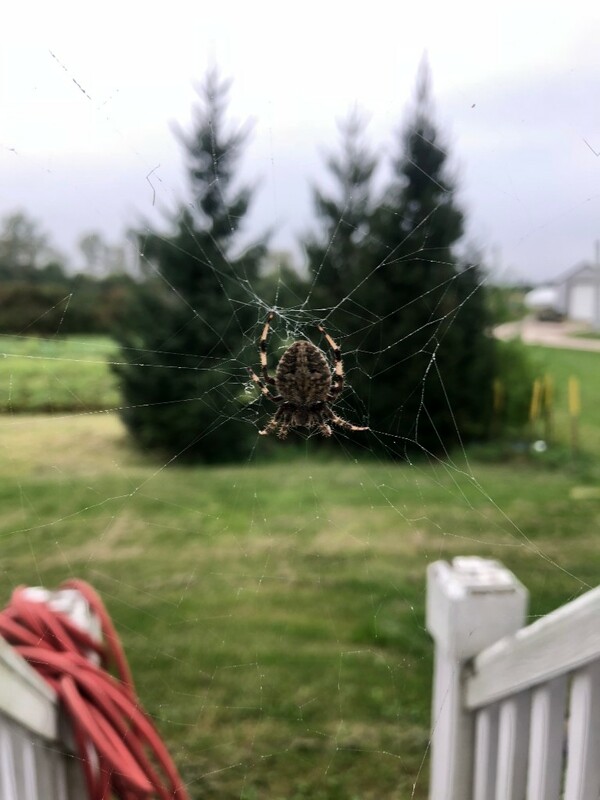 We love to notice our farm insects and animals of the farm doing the same. 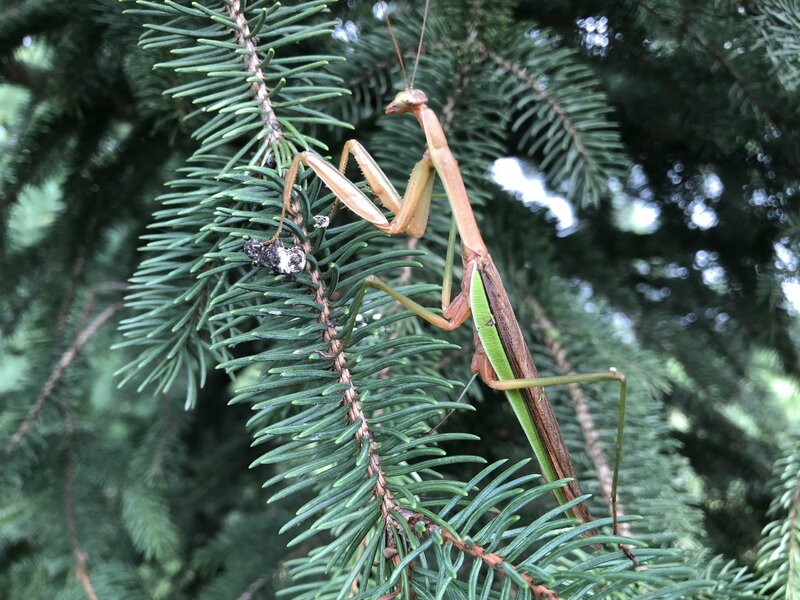 From the spiders making amazing webs each night that glisten in the misty mornings to the praying mantis watching from the evergreen trees, the whole farm seems to be hard at work preparing for the winter season. 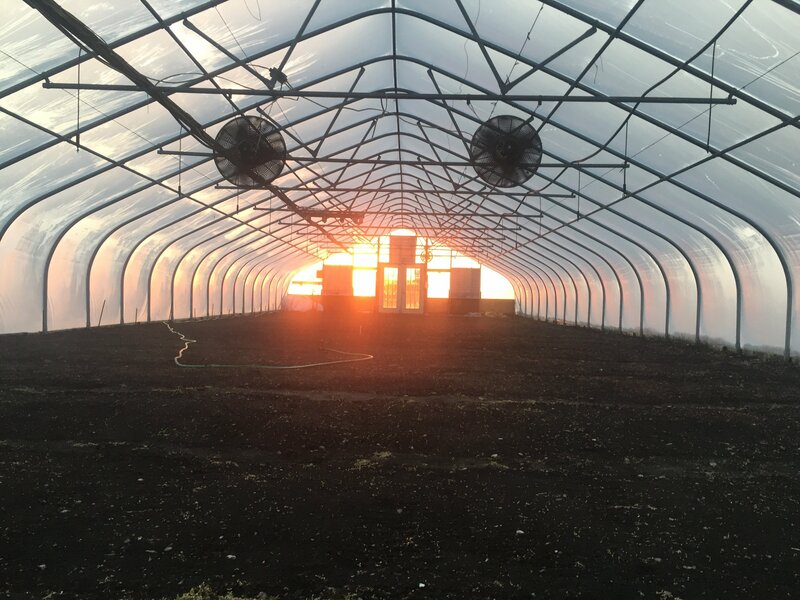 The cold to wet to hot temperatures threaten our most delicate crops in the field, which changes our work each day to make sure we're caring for whatever crops/animals need us most. Luckily, the thick blanket of cover crop continues its work to feed our soils (better soils = better veggies! ), sequester carbon and hold our soils in place. We were amazed at how it almost swallowed our cart in its growth when we went out to check on it! 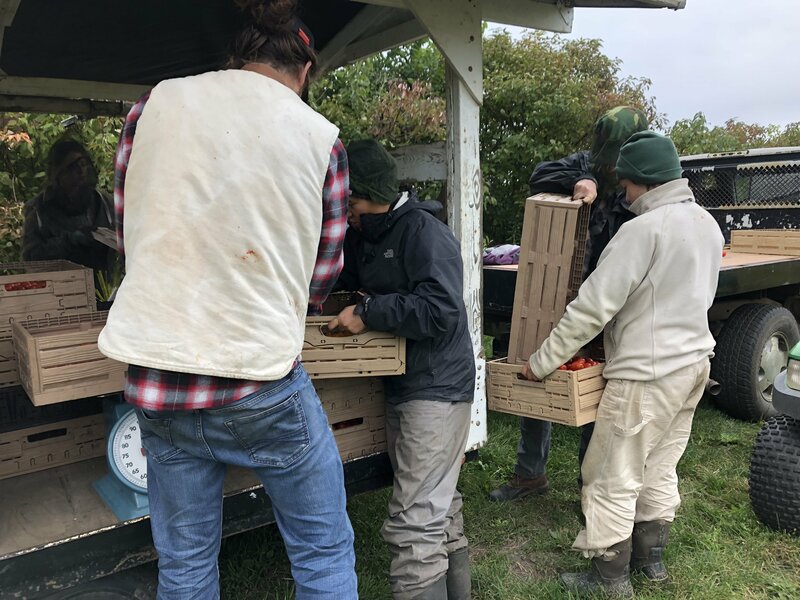 Last Friday, we worked together to pull in the last of the field tomatoes for winter preserving before a potential frost. 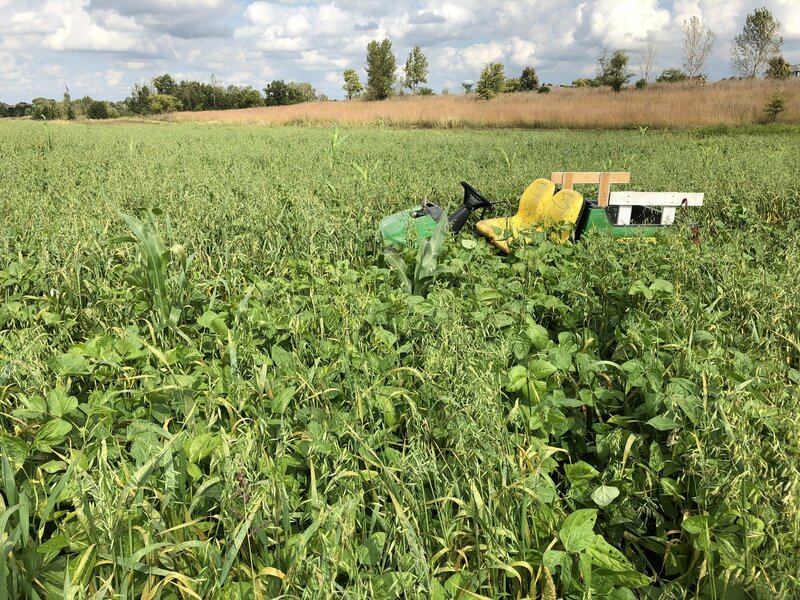 Though its sad to see summer crops go, we welcome the frost to sweeten fall brassica crops and kill some of our less hearty weeds. Finally, we work within the protected hoophouses to plant seeds and seedlings for winter spinach and greens. Luckily, we can still hear the migrating birds through the plastic walls reminding us that we're all adjusting and changing with the season. Thank you for enjoying this journey with us and enjoy this week's share of the harvest! 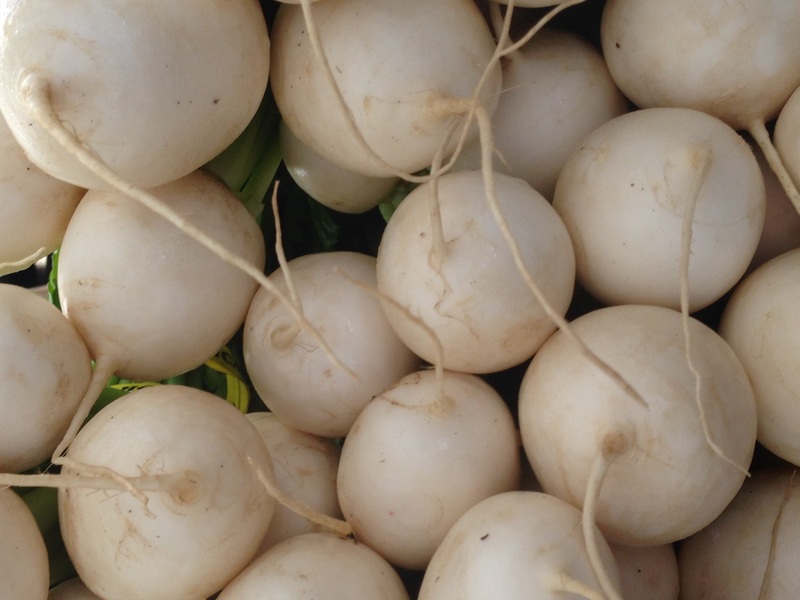 Our white salad turnip is a Japanese variety called hakurei. It is very mild and sweet and is easily mistaken for a white radish. Japanese turnips are delicious eaten raw or sautéed in a little butter and sprinkled with salt. Turnips are a good source of Vitamin C, and rich in the minerals potassium and calcium. 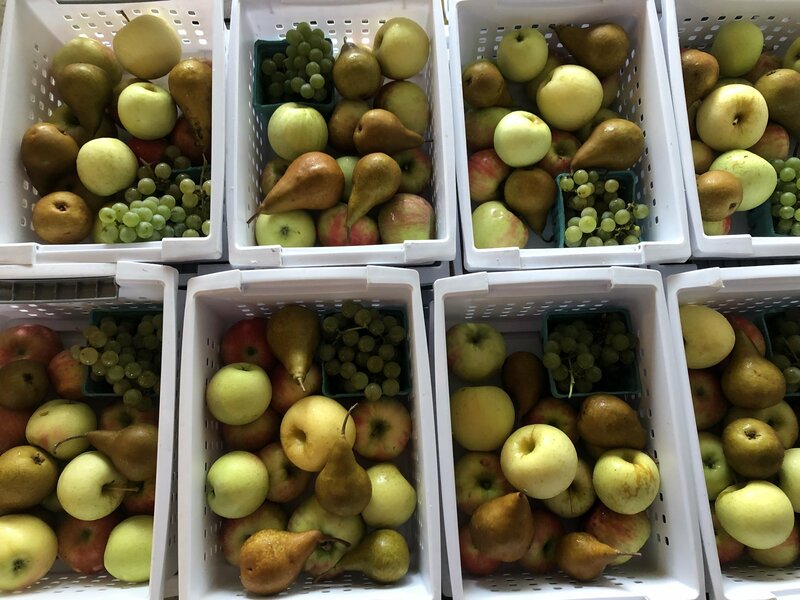 This week's fruit share include a two types of late summer apples: golden supreme (similar to golden delicious) and honeycrisp. Each type of apple varies in its flavor and texture (as do the pears we've had this season) so when we have a variety of both on hand, I love to make a traditional crumble (recipe below) to combine the contrasting flavors. The spaghetti squash comes to us from Big Patch Farm, which is an Amish community of growers located in Platteville, Wisconsin. 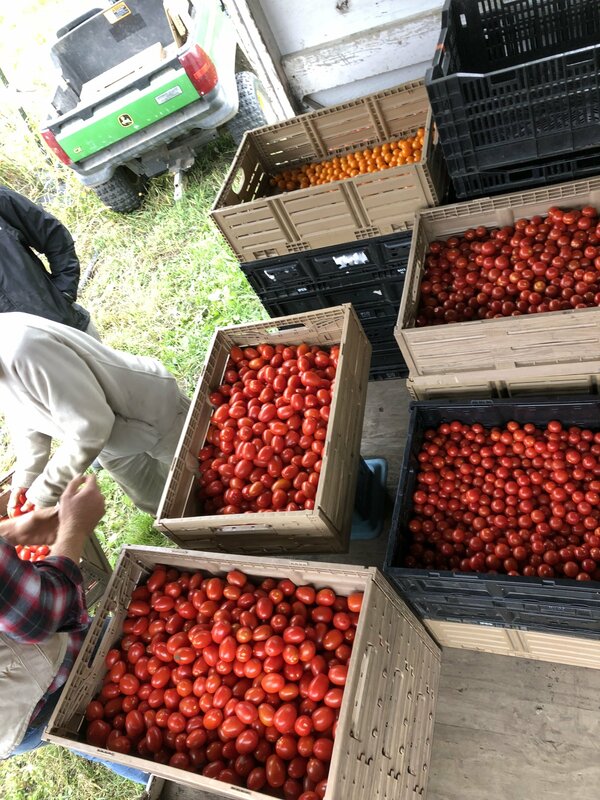 These farmers use traditional, farming techniques and work collaboratively across farms to combine multiple family harvests, not unlike our Shared Harvest Tomato Puree that we made last season! 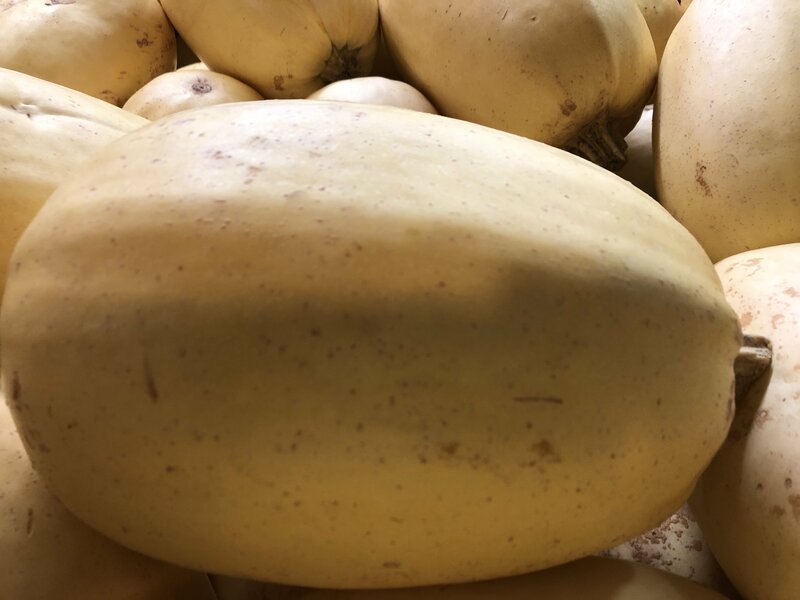 Spaghetti squash has a nutty flavor and the spaghetti squash flesh separates into long, thin strands when cooked, creating long squash “noodles.” Cook the spaghetti squash whole in the microwave or oven, then remove seeds and scrape the flesh with a fork. Substitute spaghetti squash for noodles in pasta dishes, or simply saute with olive oil, garlic, and some cheese for a simple side dish. Preheat oven to 375°F. Spray 13x9x2-inch glass baking dish with nonstick spray. Mix apples, lemon juice, cinnamon, and 1/2 cup brown sugar in bowl. Transfer to dish. Sprinkle topping over. Bake crumble until apples are tender and topping is brown and crisp, about 55 minutes. Cool slightly. Spoon warm crumble into bowls. Serve with ice cream. Serves 6. Roasted Hakurei Turnips with Israeli Couscous Salad - if you plan to make this recipe later, make sure you remove the turnip tops from your turnips so the turnips remain crispy and fresh. Use the tops as you would other cooking greens, for example in your favorite soup. Preheat oven to 425 degrees. Trim turnips from greens leaving a small stub of the stems attached. Wash both well to remove dirt. Halve each turnip, keeping the long tails intact. Finely chop the greens. Toss the turnips with 1-2 tablespoons of olive oil, pinches of salt and pepper, and the optional chili flakes. Place flat side-down on a roasting pan. Roast for 5-10 minutes, or just until the bottoms are lightly browned. Toss around in the pan with tongs, and continue roasting another 3-5 minutes. Remove from heat and let cool. Meanwhile, bring a pot of 3 cups water to a bowl and add the couscous. Continue to boil for 8-10 minutes until couscous is tender. Drain. Heat 1-2 tablespoons of olive oil over medium-high flame. Toss in the leaves and a pinch of salt and pepper. Sautee until just wilted, 1-2 minutes. Transfer to a bowl and let cool. Next Week's Harvest (our best guess)...potatoes, cabbage, apples, scallions, mixed herbs, rutabaga and more!